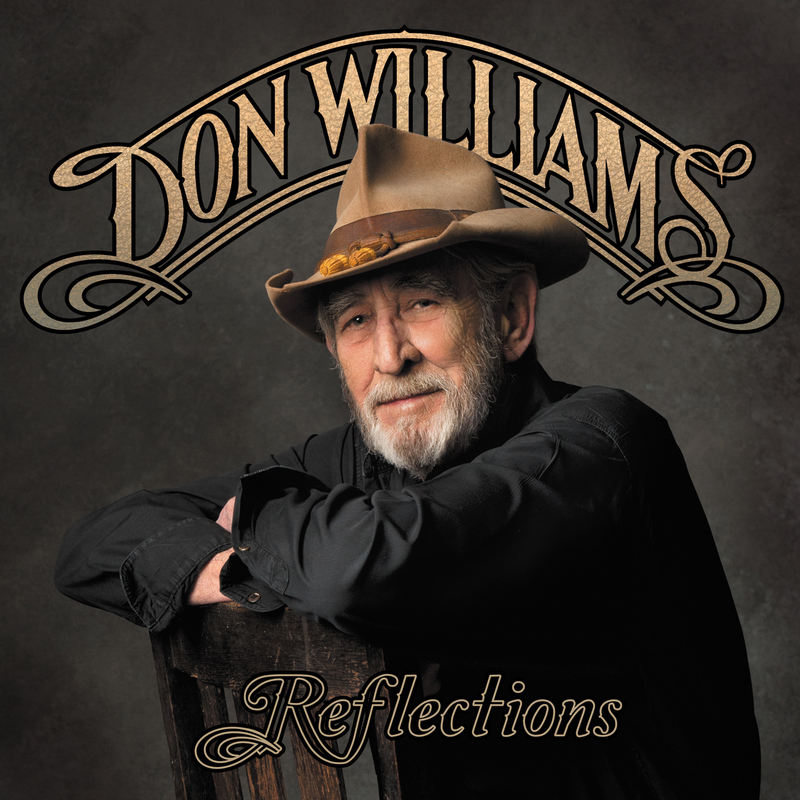 On his second Sugar Hill Release, and his third album in a decade, 74-year-old Don Williams spends a lot of time reflecting, just as the album’s title suggests. In the forty-plus years he’s been in the music industry he’s certainly earned the right, and with ten expertly chosen songs, he also gets right to the point. As per usual Garth Fundis is along for the introspective journey and he succeeds masterfully in placing Williams’ distinctive baritone front and center, allowing the conversational way in which he sings to anchor the album extraordinarily. This is no more apparent than on the one-two punch that opens the project. Townes Van Zant’s folksy “I’ll Be There In The Morning” is as honest a love song as it was forty-six years ago, with Williams breathing new life into the number with a combination of acoustic and steel guitars accentuated with ribbons of glorious harmonica. “Talk Is Cheap,” a Guy Clark co-write (with Chris Stapleton & Morgane Hayes) that previously found a home on Alan Jackson’s Thirty Miles West, lays bare our tendency to dream hypothetically and brings out the song’s urgency (‘wine’s for tasting, roads for taking’) in a way Jackson’s version didn’t. Both are two of the finest moments on record all year thus far. Jennifer Hanson, Marty Dodson, and Mark Nesler’s “Back To The Simple Things” furthers the urgency felt in “Talk Is Cheap” by lamenting on modern technology and the stronghold is has on society. On one hand Williams is calling on us to live, on the other he’s making sure we remember what’s most important along that journey – human connection. The chugging beat, which backs the song, is fabulous, too, as is the uncomplicated way Williams is gets the message across. Williams turns negative on Doug Gill’s “Stronger Back,” an antidote to the man taking the good with the bad on “Working Man’s Son.” He may be wishing for ‘a stronger back, a bigger heart, the will to keep on walking when the way is dark” but instead of letting his problems go, he just wants to embrace them and thus take responsibility. The flourishes of steel help to extenuate the track’s beautifully steady beat, and keeps the proceedings from getting too dark and moody. “Healing Hands” is another life-well-lived moment, this time from a grandchild lamenting on the calluses as a benchmark of life in one’s years and the relationship between healing hands and a kind heart. The sentiment is there in Steve Gillette & Rex Benson lyric, but the execution is too schmaltzy. Fundis nicely makes up for it and saves the song with a striking mandolin and guitar heavy arraignment that’s slightly addictive. In life, you know you ‘get it’ when you realize our days on earth are a journey full of lessons that never cease to reveal themselves to us. Steve Wariner and Tony Arata wrote “The Answer” about this phenomenon and framed the tale as a boy with countless questions for his all-knowing father. Williams does an impeccable job of bringing the ballad to life as does Fundis with his gorgeous production. Much like he did with “I’ll Be There In The Morning,” Williams breathes new light into Jesse Winchester’s “If I Were Free” not by removing the song’s simplicity, but by adding to it. He turns the folk song into a country ballad backed solely by an acoustic guitar. The track takes on new meaning, too, with Williams at the helm. With reflections on a life-well-lived, laments against modern technology, and disgust for people who dream without execution, a song like Merle Haggard’s “Sing Me Back Home,” about a man watching a prison execution, is the odd one out. But the tale does work, seeing as Reflections is an album, in part, about looking back on one’s life. The album’s real weak link is “I Won’t Give Up On You.” There’s nothing wrong with the beautiful love song at all, it just isn’t as spectacular a moment for Williams when compared to the rest of the record. Often when singers make a record they talk about the idea of ‘having something to say’ with the songs they’re releasing. It’s especially true of songwriters, which makes Reflections all the more remarkable – Williams didn’t write a single word (he did co-produce) yet he has more to say in these ten tracks than most anyone over the course of their whole careers. His gifts as a singer and song interrupter are unmatched and help to elevate Reflections above the usual faire. If you’ve been waiting for a substantive collection full of meaning, with tasteful country production and class – than this is it. I can’t recommend Reflections enough. When it comes to reviewing new releases, my philosophy is to tackle albums by artists for which I’m a fan opposed to critiquing records by artists that aren’t my taste. That way the review isn’t a one-sided analysis based solely on an already established dislike for the artist or the music. I don’t usually like to waste my time on releases that are more of the usual mainstream drivel and don’t have the slightest chance of being anything other than trend-following fodder designed for maximum airplay on the ever shrinking playlists of country radio. 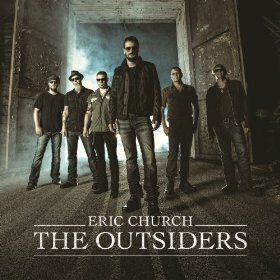 That being said, I’ve been an Eric Church fan since “How ‘Bout You” in 2006. While that might not have been my favorite song, I loved “Two Pink Lines” and “Guys Like Me.” From then on, I’ve loved the majority of his singles and count Chief among the best mainstream releases this decade. Church has always been an original who follows the beat of his own drum and I wholeheartedly respect him for being his own man in a sea of interchangeable sameness. But now it seems the biggest side effect of his success is overblown ego. Instead of using Chief as the platform from which build a follow-up record, he’s disregarded it completely and crafted what’ll likely be one of the most polarizing albums to come out of Nashville this year from a genre heavyweight. The Outsiders defies logic with a decidedly noncommercial sound that alienates the masses in favor of playing to whomever you would call the group that shares in his odd vision. When listening to the album, which the majority of critics have referred to as “groundbreaking,” I kept searching for those more normal moments, songs like “Springsteen” or even “Love Your Love The Most” that I could easily enjoy (or see on country radio as potential singles). While they were hard to find, thankfully they are there in some form or another. “Talladega,” co-written by Church and Luke Laird, is the most conventional and thus the album’s strongest moment overall. A story of friendship, the tune centers around five friends and their unforgettable times together at the famed racetrack. It’s a near perfect slice of rock-country and a song that wouldn’t have been out of place on Tim McGraw’sSet This Circus Down. Church teams up with his “Springsteen” co-writers Jeff Hyde and Ryan Tendell for “Roller Coaster Ride,” a more progressive experience sonically, but a darn catchy tune with a nice hook (“Since you had to go, I’ve been on a roller coaster ride”). Also appealing is drinking song “Cold One” in which a man is lamenting the sudden end of a relationship when his girl leaves him ‘one beer short of a twelve pack.’ The track would’ve been a home run had Church and producer Jay Joyce kept the ear-catching backwoods arraignment that opens the track. When it morphs into the progressive hip/hop meets EDM mess towards the second verse, I’m all but lost. But the writers (Church, Hyde, and Luke Hutton) have written a fantastic lyric, and that about saves the whole thing. As a general rule, Church is often better lyrically than sonically. Often, his best songs (think “Creepin’”) are as loud and obnoxious as they are lyrically inventive and original. That’s why I was kind of upset when the title track dropped last fall and left me cold. “The Outsiders” has since grown on me lyrically, but I still hate the heavy metal breakdown towards the end. Thankfully I do love second single “Give Me Back My Hometown” warts and all. It’s a far cry better than almost everything currently on country radio and one of the most exciting songs released so far this year even though it doesn’t have much to do with country music beyond Church’s audible twang. The only other song on the project I can confess to liking even a little is “Broke Record,” since it is catchy although it wears thin on repeated listenings. The rest of the project, unfortunately, is a mess. Church mumbles his way through “A Man Who Was Gonna Die Young” and thus renders the lyric impossible to understand. “Like A Wrecking Ball” features Church’s voice marred in an annoying echo effect, “That’s Damn Rock and Roll” is the dictionary definition of dreck, “Dark Side” is too moody, “Devil, Devil” is just awful, and “The Joint” is too hip/hop inspired (if that’s even what you call it) for my taste. Given my admiration for Church has an artist, I wanted to love this album. But too many of the songs left me wishing for the formula he perfected with Chief and rightfully won the CMA Album of the Year trophy for. The Outsiders is an uneven album at best, heavy on experimentation and light on good quality music. But thankfully Church manages to keep his head out of the gutter for at least some of the tracks, and if his label is smart, those are the ones that’ll be sent to radio for a shot at heavy rotation airplay.